A rocky shore consists of rocky ledges with pools of salty water, boulders and pebbles. Living in this habitat is a community of hardy plants and animals and each species is specially adapted for coping with the harsh environment around it. A rocky shore consists of rocky ledges with pools of salty water, boulders and pebbles. Living in this habitat is a community of hardy plants and animals and each species is specially adapted for coping with the harsh environment around it. The plants and animals interact with each other and with their habitat to form the rocky shore ecosystem. Depending on its situation, a rocky shore may be in an exposed or sheltered area. 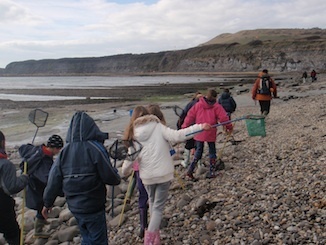 Of all seashore habitats, the sheltered rocky shore is probably the best type to study, having very large numbers of species and often in great abundance. Rocky shore species have to be able to survive the continual cycle of changing tides which may leave them either high and dry or submerged in water for varying lengths of time. Spring tides (from the Old English word ‘springen’, to rise) occur every two weeks at times of the full and new moon. The best time to study the shore is during these tides as they rise further up and drop lower down the shore than neap tides, which happen between spring tides. Seashore life occurs in zones on the shore, according to how tolerant different species are of exposure to air and sunlight. Above the level of the highest tides is the splash zone, strongly affected by salt spray. The upper shore is not covered by every high tide, usually only those of spring tides. Very few species can tolerate the relatively dry conditions of the upper shore. Most seashore animals and plants live in the middle shore, the main area of the shore which is covered and uncovered by every tide. 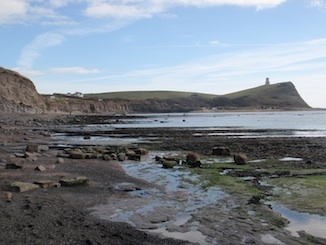 The lower shore is only exposed during the low tides of spring tides, and this is where many delicate species may be found – those that cannot withstand much exposure. Animals that feed mainly on plants are called herbivores and most seashore herbivores, like the limpet, feed on young seaweeds (algae). Others, for example zooplankton (microscopic animal life), feed on phytoplankton (microscopic plant life in the sea).